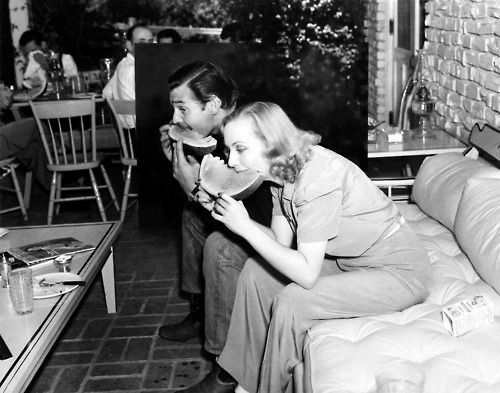 The photo above shows Carole Lombard and Clark Gable at their Encino, Calif., ranch. 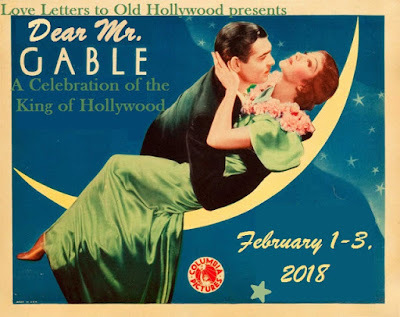 This is article is part of Dear Mr. Gable: A Celebration of the King of Hollywood hosted by Love Letters to Old Hollywood. 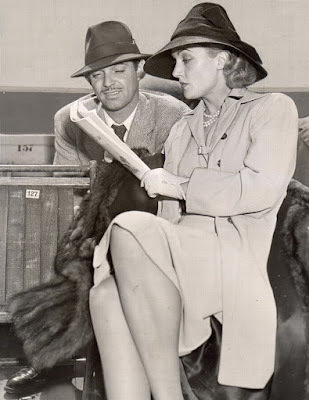 During their three-year marriage, Clark Gable and Carole Lombard were the king and queen of old Hollywood. 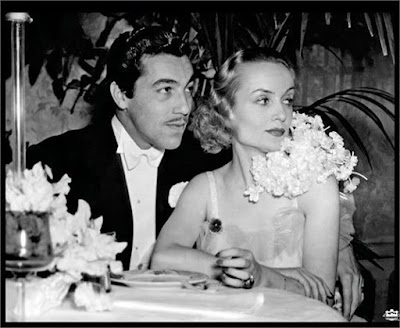 Their glamorous union and the tragic circumstances of Lombard's death led to a thousand fan magazine headlines, but, underneath their movie-star status, Gable and Lombard were two down-to-earth former Midwesterners who shared a deep and enduring bond. Gable and Lombard were born six years and 250 miles apart. Gable came into the world on Feb. 1, 1901, in the small southern Ohio town of Cadiz to oil-well driller William Gable and his wife, Adeline, who died when Gable was 10 months old. 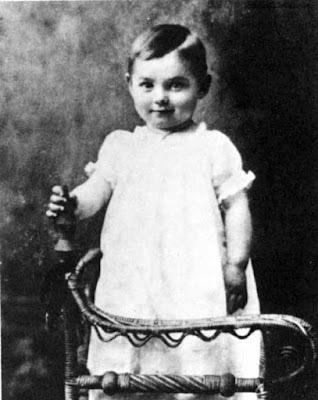 Gable grew up mostly in Cadiz, but the family did move to Portage County Ohio in 1917 because his father purchased a farm. Gable worked a series of odd jobs after high school, but he eventually decided to pursue a career as an actor. He landed in Hollywood in the 1920s where he often appeared as an extra or in bit parts. (Photo source: Dear Mr. Gable). 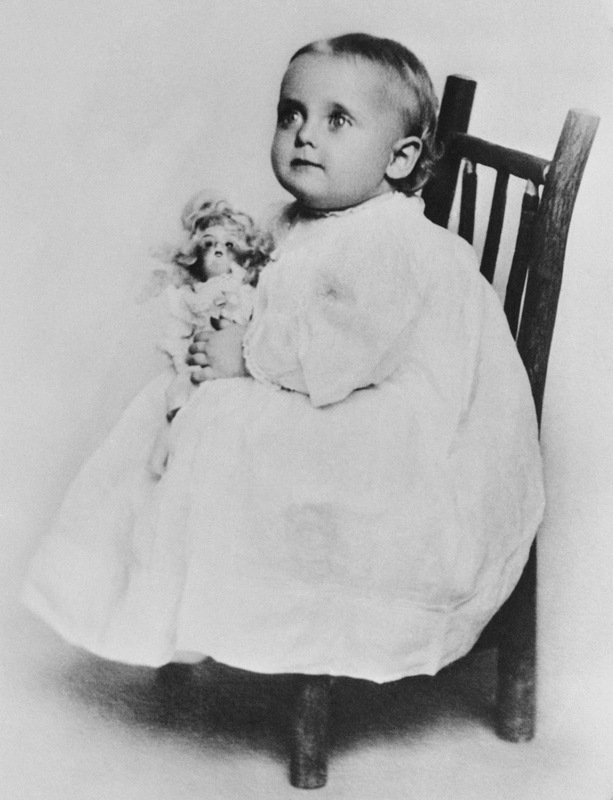 Lombard was born Jane Alice Peters to a prominent Fort Wayne, Ind., family on Oct. 6, 1908. At age 6, Lombard moved with her two older brothers and mother to Los Angeles where the young tomboy enjoyed playing in the sunshine until she unexpectedly got a small part in the silent melodrama A Perfect Crime (1921). Lombard eventually earned a contract with Fox Films. While there, she began using her stage name; the Carole was for a friend and the Lombard honored her neighbors (Photo Source: Carole & Co.). Gable and Lombard's first brush with each other was in Fox's disaster epic The Johnstown Flood, although they didn't actually meet. 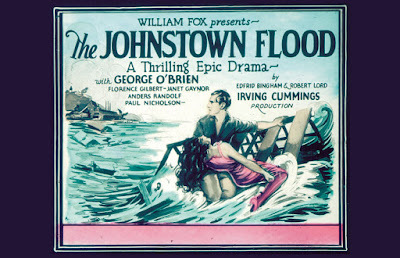 Lombard had a small part as a friend of leading lady Florence Gilbert, while Gable was an extra in a saloon scene (Photo source: Johnstown Area Heritage Association). 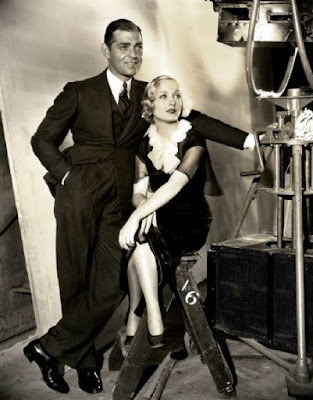 Gable and Lombard were both up-and-coming stars when they made the pre-code drama No Man of Her Own. Despite the fact that Gable's card sharp and Lombard's librarian were hot and heavy throughout the entire film, no romantic relationship developed off screen (Lombard later remembered not even getting "a tremble" from Gable). In any case, they were both married to others at the time: He to socialite Ria Langham; she to actor William Powell. The lack of romantic feelings didn't mean that Gable and Lombard didn't get along during the filming. In fact, they enjoyed joking around and giving each other gag gifts. 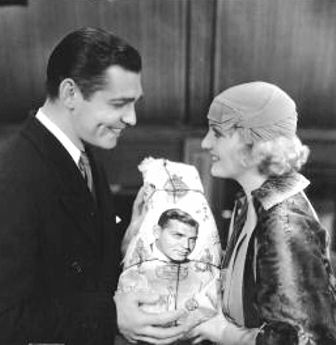 Lombard presented Gable with a large ham with his face on it (photo above); the actor retaliated by giving Lombard a pair of clown shoes (Photo source: Dear Mr. Gable). 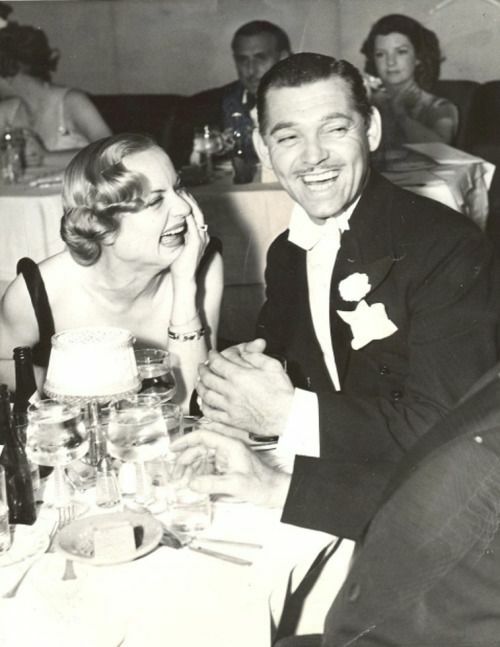 Gable and Lombard saw each other from time to time through the years, but they didn't connect romantically until 1936. The event was the Mayfair Ball, an annual Hollywood party that Lombard hosted at the request of producer David O. Selznick. Lombard's date was the suave Cesar Romero (photo above), but she shared a dance and a car ride with Gable and their romance soon became the talk of Hollywood. Click here for a fascinating article about the Mayfair Ball from Dear Mr. Gable that includes the story of how Norma Shearer pulled a Jezebel. (photo source: Pinterest). After the Mayfair Ball, Gable and Lombard were inseparable. 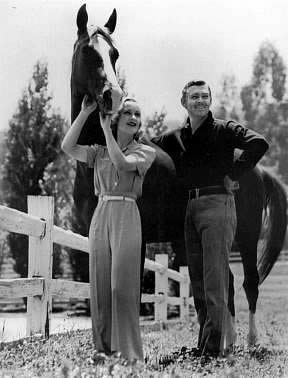 However, Gable was still married to Ria Langham, and she did not grant him a divorce until March 9, 1939. Gable and Lombard married shortly thereafter on March 29 in a simple ceremony in Kingman, Ariz.. They repeated their outfits -- a dove-grey suit with polka dot shirt for her and a blue suit with patterned tie for him -- at a photo call the next day (photo above). 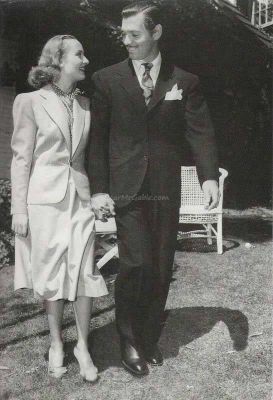 Gable and Lombard, who affectionately called each other "pa" and "ma," soon settled into married life at their 20-acre ranch in Encino, Calif. The photo above shows them chowing down on watermelon. The couple were never blessed with children, but they both loved animals and lavished attention on their large menagerie of pets that included everything from horses (photo above) to turtles. 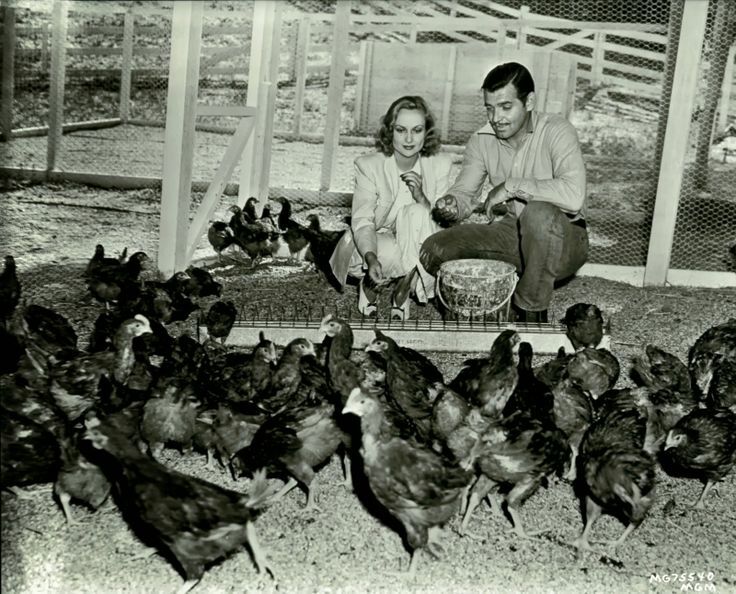 The Gables were especially proud of their brood of chickens (photo above). For awhile, Gable even indulged the idea of marketing his home-laid eggs under the brand name "The King's Eggs," but those plans never came to fruition. 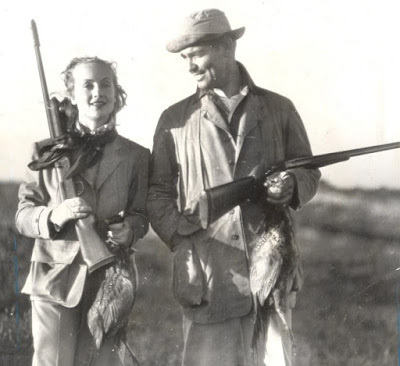 Lombard always enjoyed sports (she was a skilled tennis player), but she became an outdoors-woman after marrying Gable, who was an avid hunter and fisher. The photo above shown them on a duck hunting trip (Photo source: lisapiestch.com). Gable and Lombard were homebodies, but they occasionally enjoyed a day out, such as this 1937 trip to the races. (Photo source: Pinterest). 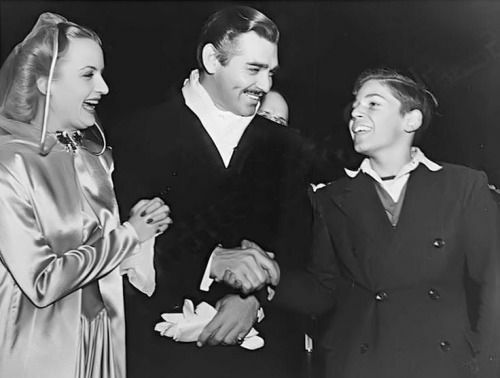 The Atlanta premiere of Gone With the Wind (1939) was a star-studded affair, but Gable, who played Rhett Butler in the film, and the glamorous Lombard stole the show. The photo above shows them greeting a young fan. Lombard was eager to help her country after the U.S. entered World War II in December 1941. 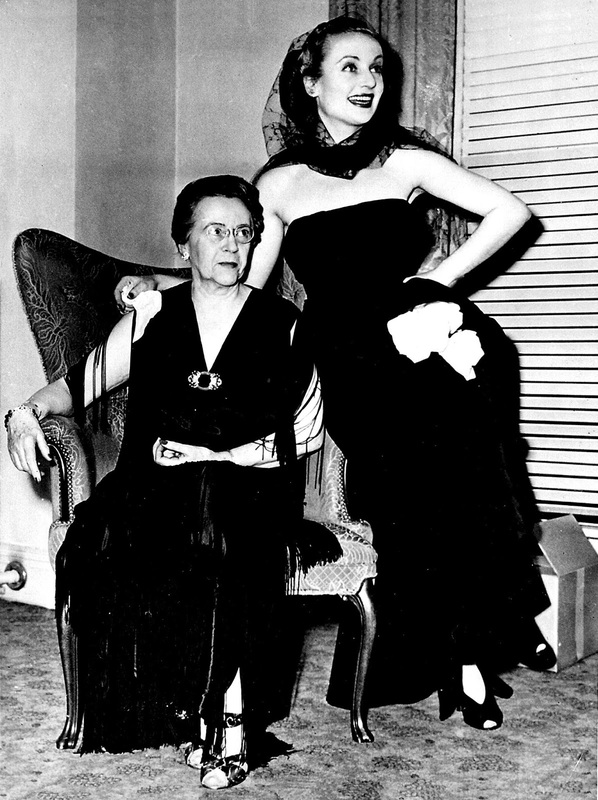 The actress and her mother (photo above) embarked on a trip to Indianapolis in January 1942 where the popular Lombard sold $2 million in war bonds at a patriotic rally The group traveled to Indiana by train, but Lombard was eager to get home, so she decided to take a plane back to Hollywood. Tragically, everyone on board was killed instantly when the plane crashed into a mountainside outside Las Vegas on the night of Jan. 16, 1942. 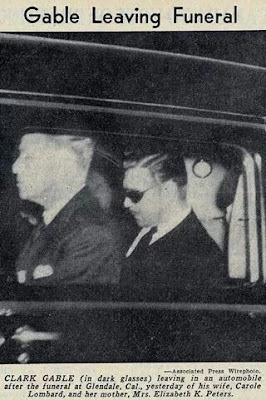 Gable was devastated by Lombard's death as you can tell from this newspaper photo taken at her funeral. He traveled to Las Vegas as soon as he heard the news and had to be prevented from climbing up the treacherous mountainside in an attempt to retrieve his beloved wife's body. After her funeral, he retreated into isolation for a month, before returning to MGM to complete the war drama Somewhere I'll Find You (1942). He then enlisted in the U.S. Army Air Corps where he flew five bombing missions over Germany and rose to the rank of major (German dictator Adolf Hitler allegedly put out a large reward for Gable's capture). 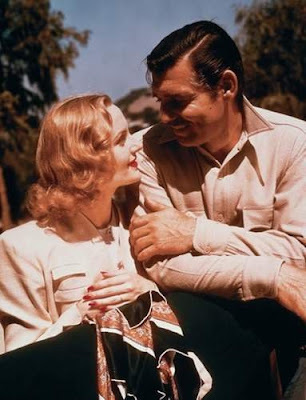 Gable returned to Hollywood after World War II and remarried twice, but he was never quite the same after Lombard died. "There was always a light in his eyes," one friend said. "That light went out." The photos of Clark Gable just after the plane crash and funeral are heartbreaking. It seems to me that after Carole's death, he aged significantly (and I'm sure his experiences in WWII didn't help much, either). Thanks for this thoughtful overview of their relationship. He died at such a young age, and I'm sure the stress and grief of dealing with Lombard's death didn't help his heart problems. Great post, Amanda! I had never heard that before about the movie they were in before No Man of Her Own. You picked a lot of fun photos, too -- I love that one of the ham with his face on it. That gag gift is so typical of Carole. Thanks for hosting. I'm looking forward to reading the other entries. I was moved by they way you wrote about their relationship and accented it with pictures. I LOVE THIS! I always get emotional about Gable and Lombard- their love affair was short but legendary! Wonderful pics- I have never seen some of them before!